Your soul is oftentimes a battlefield, upon which your reason and your judgment wage war against your passion and your appetite. Would that I could be the peacemaker in your soul, that I might turn the discord and the rivalry of your elements into oneness and melody. But how shall I, unless you yourselves be also the peacemakers, nay, the lovers of all your elements? Your reason and your passion are the rudder and the sails of your seafaring soul. If either your sails or your rudder be broken, you can but toss and drift, or else be held at a standstill in mid-seas. 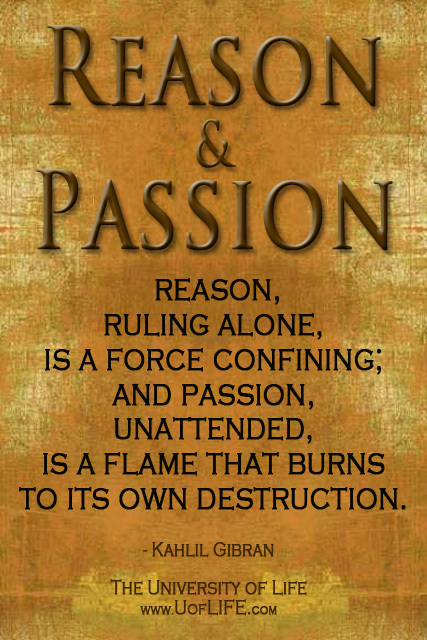 And let it direct your passion with reason, that your passion may live through its own daily resurrection, and like the phoenix rise above its own ashes. I would have you consider your judgment and your appetite even as you would two loved guests in your house. Surely you would not honour one guest above the other; for he who is more mindful of one loses the love and the faith of both. And since you are a breath in God’s sphere, and a leaf in God’s forest, you too should rest in reason and move in passion.